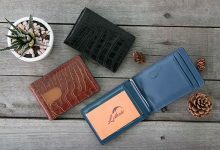 When it comes to choosing a wallet, I personally realize that our preference and demand will change time after time. For example, with adults, we tend to look for those subtle, elegant and minimalist designs whereas teenagers like to opt for vibrant, cute or masculine and fashionable wallets. Besides, as they also prefer to carry the whole world alongside, a wallet with spacious capacity is also a must. If you are finding a brand-new character wallet, you’re in right address, girls! 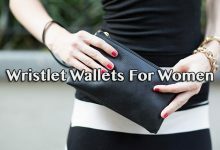 In this article, I will round up best of the best wallets for girls that not only roomy, beautiful but also high quality and bang for your buck. 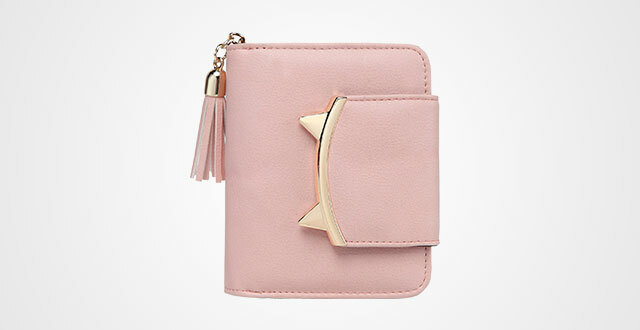 Start off this collection with a super cute wallet for teenage girl from Fakeface. I’m so excited to talk about this product because its outlook is really a girl-killer. Too cute to make your heart stop! As you can see that on the frontside, it features a lovely graphic girl image and actually, there are a lot of cute versions with different colorways so, if you don’t find this meet your taste, there is surely at least one in their list will satisfy yours. Besides, the print is really nice, high-quality and smooth that it won’t get wears and tears easily and quickly. Another plus point is the ultra-soft PU leather to offer a very comfortable feeling touch. Other than beauty, softness and high quality, this crossbody is also multifunctional as it comes in moderate dimensions, roughly 7.5 inches long and 5.9 inches wide, which is large enough to fit up modern smart phones like iPhone, Samsung Galaxy Note, iPod and even a small camera. On the other hand, it also has an additional zippered pocket on the backside to fit up loose change, cards, coins or keys for quick access. Another convenience is its removable strap. 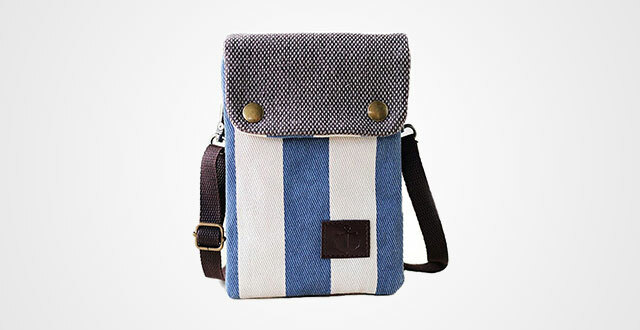 You can attach it to the bag and use as a crossbody bag and shoulder bag, or, remove it to use as a wallet or purse. Who can say no to tassel? This cute wallet from UTO features a bi-fold silhouette so that compared to the Fakeface above, it provides larger capacity for those who’d like to bring your world alongside. It has 6 card slots, 1 bill compartment, 1 ID window and 1 zippered pocket. In general, you can keep your stuff like cards, paper money, coins, IDs and photos neatly in this product. It’s well-made and durable to bear a heavy load up to 10 cards, 10-15 bills, 1-2 photos and a couple of coins. However, I must admit that the more your load, the fatter it is. And though it’s made out of high-quality PU leather with good flexibility and durability, I personally don’t advise you to overload to this small piece to keep it last as long as possible. 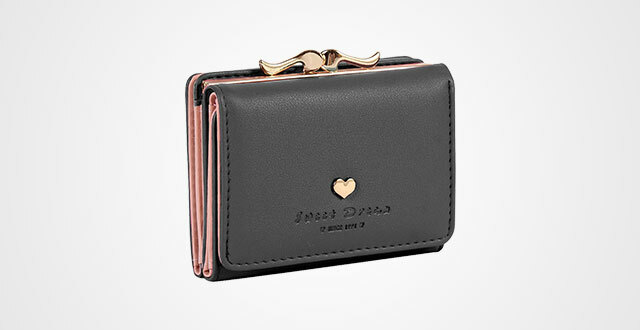 This wallet provides quite many colors, such as black, light purple, pink and red rose alongside with two design, one with cat hardware detail and one with swan. Oh my god, cat lovers, show me your hands!!! 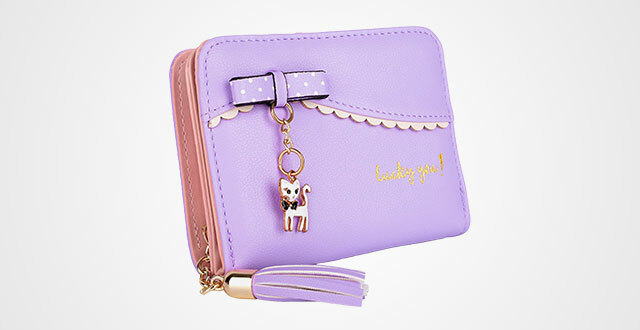 This adorable Shayin cute wallet is a must-have item in any obsessive cat disorders, not only for its cute outlook, but also for its functionality and convenience. Firstly, made mostly out of high-quality canvas, it is very easy to maintain and clean. You just need to get it machine washed and then the piece will look like new again. Besides, 10 percent of its material is polyester which means the wallet can be stretchable and flexible to fit up some more stuff. Another good thing is the stylized cats on its outer performance isn’t printed but made from leather so that you don’t need to worry about them getting wears and tears after a long time using. Even with a little “abusing” treating, the wallet still holds up well. In terms of capacity, it includes 5 card slots, 2 zippered pockets, 1 photo holder and 1 bill compartment. I appreciate the dual zippered pockets as they help me to streamline my coins and keys in separate space for better protection and storage. It’s kind of quick access as well, very convenient. Choose from five colors, consisting of black, pink, blue, sky blue and coffee. 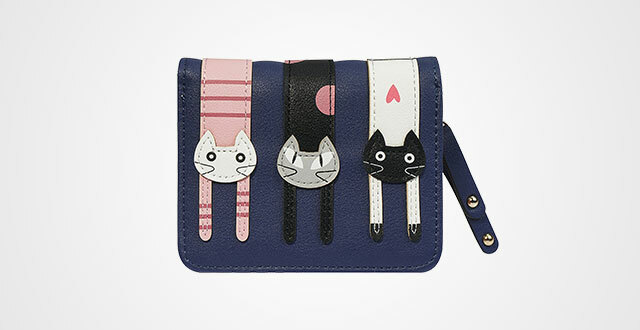 Another lovely mini purse for cat lovers. 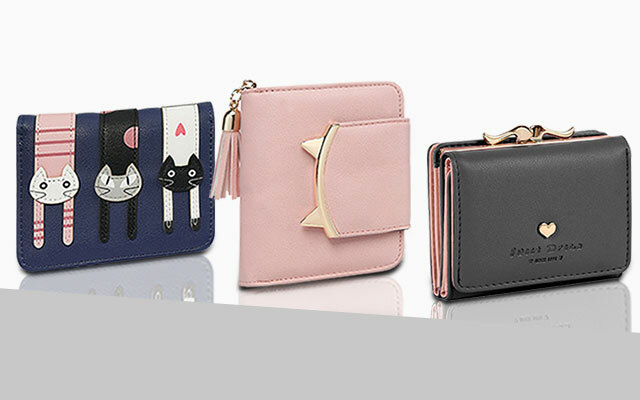 Though these wallets for girls don’t come in three cute cats like Shayin, it features a stylized snap button, which is enough to melt our heart. This one is totally made out of the finest leather. For those who don’t know, nothing can beat against leather for durability, softness and flexibility. However, at first, it might take some times, like a couple of weeks to break in, which kindly understand. Going inside, you will quickly find that there are 4 card slots and 2 full-length compartments for better organization to your bills and other stuff like that. With this piece, you can easily style with different outfits thanks to its simple, elegant yet cute outlook. There are also 7 colorways to go to, including black, pink, green and sky blue. 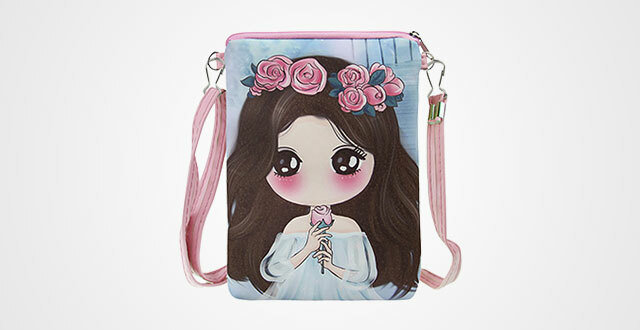 If you love mini purse with feminine and girly kiss-lock closure, don’t miss out these cute wallets for girls. The combination of soft PU leather and shiny gold-tone metal creates a luxurious and elegant look. Not saying that its outer performance is much simpler than the 4 previous wallets. There is a small subtle heart metal hardware detail on the frontside enclosed with nicely embossed “Sweet dream, since 1991”. I personally think these wallets for girls are a perfect party wallet to make you not only cuter but also outstanding from the crowd with feminine yet luxurious look. Going inside, you will easily find 7 card slots, 1 ID window and 1 large bill compartment. Next is the kiss-lock portion which contains a spacious room for coins, keys and other small things like that. It enables to fit up your daily carry or everything needed for a party, prom and other events. 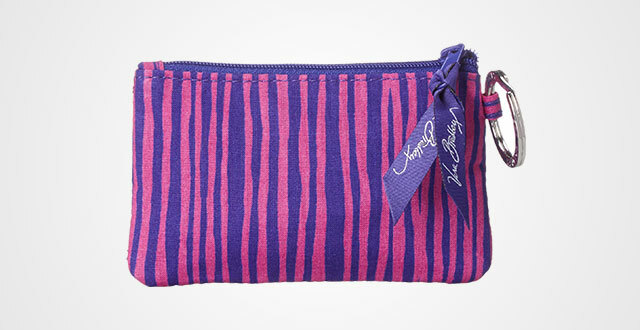 Measured by 3.93 x 3.14 x 1.18 inches, it’s also compact to be a handheld purse or put in your handbag without bulk. Choose from 8 color options, including black, light green and light blue. For a cute but not too girly, you can’t go wrong with these Witery purses for girls. The very first impression about this item is compact. Considering it measures 7.5”x5”x1” with a long strap, you can use it to accommodate your smart phone. It can fit up many kinds of nowadays cell phone like iPhone, Samsung Galaxy Note, Lumia and LG G Flex. Other than that, there are spaces for other stuff like cards, coins, keys, cosmetics, etc. as in fact, inside this small piece, there are two large compartments, 1 mini pocket, 1 zippered pouch and 2 snaps for better closure. Another good thing is its shoulder strap made out of thick sturdy cotton to deliver striking durability to serve you for years. Along with that, the hardware is retro bronze. For those who are wondering about its material, the wallet is made out of high-quality PU leather to not only give a soft and comfortable touch, but also durable and longevity feature. Besides, the material is kind of eco-friendly to not cause irritation or allergy to sensitive skin. Last but not least, you can remove the strap whenever you want to change it into a handheld wallet, a purse as well. I know that a lot of girls a Disney die-hard fan so that this list can’t lack of at least a wallet figuring a Disney’s character. 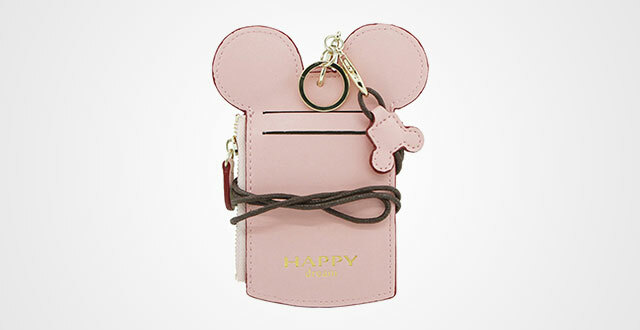 And here it is, lovely pinky little girl wallets with Micky Mouse silhouette that surely will make you stand out from the crowd and receive countless compliments. 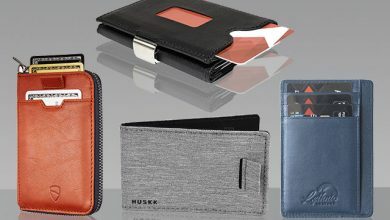 Along with its fashionable outlook, the wallet also comes in convenient and functional feature with soft Pu leather, comfortable texture to wear, spacious capacity, lightweight, durable and reliable warranty. There are 2 card slots, 1 bill compartment and 1 zippered pocket to fit up an everyday carry of any girls. Other than a neck bag to store your essentials, it’s also an interesting and impressive item to bold your attire and show up your characteristics. Choose from three color options, including black, red and pink, you can easily pick up the right one for yourself or a present for your friend who is also a Micky Mouse lover. If patterns are your taste, consider these beautiful Vera Bradley wallets. There come countless lovely stylized patterns for you to choose. I’m quite sure that you will pick at least one from their collection. But here, I’ll talk about this Impressionista Stripe design which is also my favorite. First thing first, it is made out of 100 percent high-quality cotton for striking softness yet hold up pretty well. You also can wash it easily by washing machine to make it look like new again. In fact, this material doesn’t require as complicated maintenance as leather or other types of materials. Secondly, there is a ring on the side to easily connect your wallet with hooks or key chain. 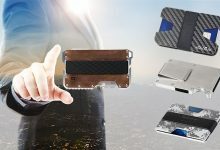 The wallet also features a compact and small design as well to conveniently handheld or put in your handbag without bulk. However, don’t quickly underestimate its capacity. This item can fit up a lot of cash and coins, not saying that other than a large major zippered compartment, there is a clear ID window on the backside for quick access your identity cards or other regular stuff. You are magical like a unicorn. 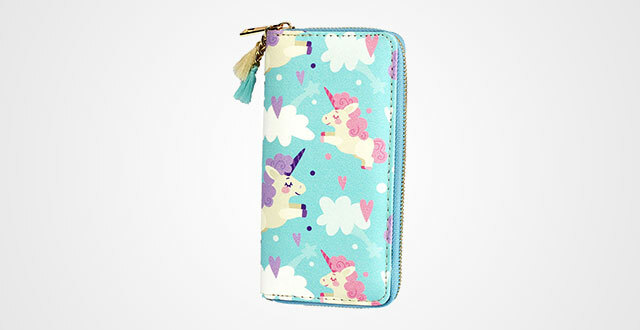 Vary your unicorn collection with these lovely rainbow unicorn wallets for teens from Timlee. Though this is a new brand, their product is amazingly high quality with Heavy-duty nylon zipper to deliver not only smooth, beautiful outlook, but also striking durability. Measured by (L)7.8 in x (W)3.9 in x(D)1.2 inches, it doesn’t come up with too large to become bulky, but very compact and easy to handheld. I personally like its tassel on the zipper which is an interesting emphasis to make you even more attractive and outstanding. 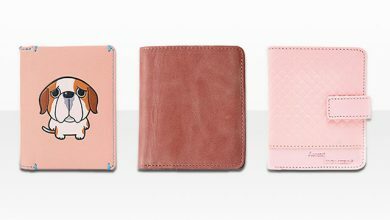 In terms of interior, these wallets for girls include 8 card slots and 3 full-length compartments to accommodate your cards and cash neatly and safely. 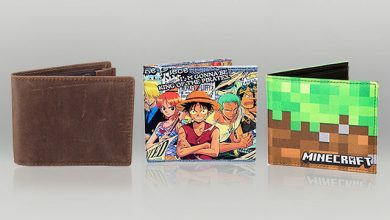 Another good thing about this wallet is its variety of colorways and patterns so that you will at least choose one favorite from this list. 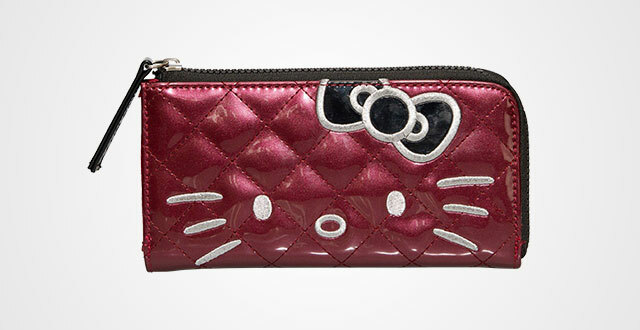 Lastly, Hello Kitty girly wallets that’s already licensed officially. Thus, just keep in mind to add it to your Hello Kitty collection. This long wallet comes in 8 inches long and 4 inches wide with neat and well-organized interior to make sure to fit up your everyday carry, especially for those who particularly like to carry your world alongside. It contains 4 card slots, 2 full-length compartments and 1 zippered pocket. And if you are curious about its material, the wallet is made out of Shiny Leatherette to deliver a polished look to make you outstanding and become a center of any prom or party. Or, you can use it as a daily wallet for casual occasions such as go to school, hang out, go to the bookstore or library based on its multiuse outlook and spacious interior. 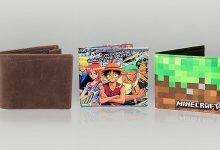 Have spent hours to round up this collection, I’m quite confident that you will be satisfied to pick out the best wallets for yourself. If you have some better, cuter and more beautiful wallets for girls, don’t hesitate to share with us so that we can together fulfill this list.